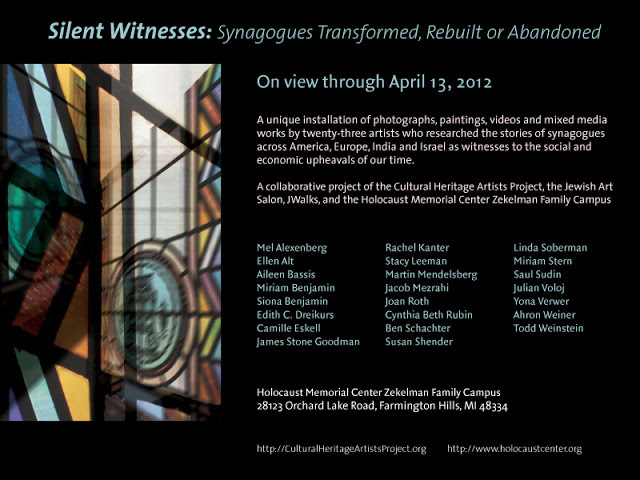 On February 20th, 2012, the innovative new exhibition Silent Witnesses: Synagogues Transformed, Rebuilt or Abandoned opens at the Holocaust Memorial Center in Farmington Hills, Michigan. As the world of the artist expands beyond the narrow confines of the art market, we are seeking a way to create exhibitions from the ground up that involve artists as creative thinkers. We wanted to stimulate artistic discourse within the community, not discourage artists by burying them under a mound of proposal writing and other paperwork. We gave artists a topic and time to research this topic, think about the topic in new and inventive ways, and then to make new work emerging from their own artistic process. Artists have always shared work in development with other artists. Thirty years ago, we shared studio space. Today, we can supplement that sharing with the internet. For this project, we used a private website where artists’ first ideas, and then works in progress, and finally finished pieces were available to other artists to view. What emerged – and what we hope will continue to develop for the next time – is a shared sense of invention. The inclusion of scholarly essays in this publication is central to our mission. We are engaging topics. We have insights, we have ideas, we have ways to illuminate. Working with the Holocaust Memorial Center in Detroit has opened a meaningful exchange of ideas. How do we display history, how do we make the past accessible?